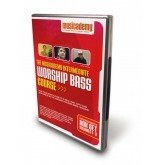 Take your playing skills to new levels with this set of worship focussed bass lessons. This course covers a years' worth of worship focused lessons and is suitable for existing bass players who want to broaden their skills. 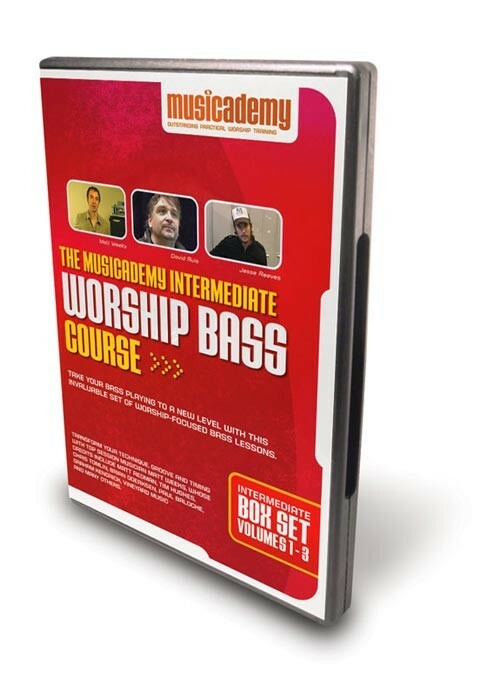 2 hours of lessons, practice tracks, loops and tips from top worship bassists on each DVD including Chris Tomlin's bass player, Jesse Reeves. The trailer above features both the Beginners and Intermediate Worship Bass DVDs. Three 2-hour DVDs in a box set. The equivalant to a years' worth of online lessons. Songs featured on this DVD set include Holy Holy, Hungry, Majesty, Your Love is Amazing, Consuming Fire, Praise to the Lord the Almighty, Here I am to Worship and You Never Let Go. As an Intermediate course, this box set is suitable for competent bass players who want to improve their playing skills and ability to produce creative, tasteful bass lines. 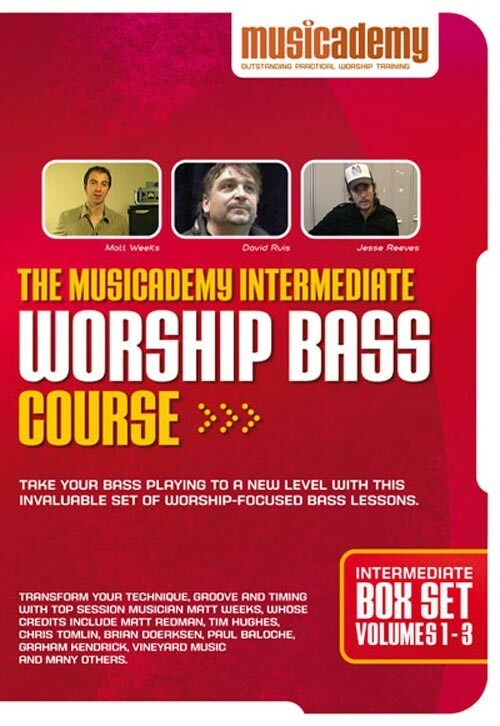 If you're not yet ready for the Intermediate course then take a look at the Beginners Worship Bass Course which is available either in a box set or as individual volumes. Some players who are not complete beginners may like to start with volumes 2 or 3. Is there anything ability-wise between Beginners and Intermediate? 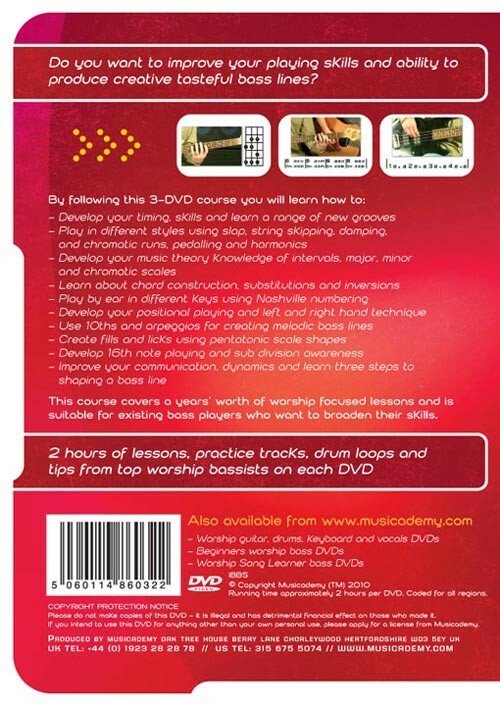 Yes, the Song Learner Series is perfect for people who have completed the Beginners DVDs and want to consolidate their playing by learning some great bass parts to other worship songs before progressing to the Intermediate DVDs. The Song Learners are available in 3 DVDs or as individually downloadable online lessons. 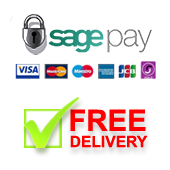 We have a DVD called Worship Backing Band - Musicians Practice Tracks which contains 54 worship songs that you can play along with. Practice is a lot more fun with other people! You can select to take any one instrument out of the mix so you effectively get to play along as the bass player in a pro band. The DVD shows on-screen words and chords. There is also the option to play along to a click track which will really help develop your timing. Are the Intermediate DVDs available as individual volumes? No, we find that the vast majority of customers at this level prefer to buy a full course so the Intermediate DVDs are only available as a box set. Matt is a great bass player and easy to follow. Just a note to tell you how much I enjoy the bass DVD's. Very informative and easy to use at my own pace and at my own time. I learn something new everytime I view them. Honestly, for the money, they are a wealth of musical instruction. I love to play the bass in my church, and all I knew was not much. I was a beginner for many, many years. I spent a lot of money before, buying expensive books hoping to learn more but in the end they collected dust on the shelf or went for recycle long time ago. ...So I decided to give a try at first buying the Worship Bass Beginners and in less than a month I bought the Worship Bass Intermediate all three DVD's, The Song Learner Series for Bass all three DVD's and the Advanced Bass in Worship 3 DVD Box Set. Trust me, every penny was worth it. If you want to save money go ahead and buy those DVD's you won't be disappointed. I wish I had them 20 years ago. God Bless you all at Musicademy for doing such a great job producing those videos for all of us who want to Praise God in our Churches. I highly recommend this DVD series. You can go at your own pace and go back and practice things over and over if you want, or skip parts you don't want to see again. I think it's much more useful than a seminar that flies by too fast.